You might be wondering why Lefty's is doing a movie review. That's not our thing, right? Well there are times to make exceptions. And this is one of them. and you absolutely must see it once you get the chance. Besides the fact that the movie is stunningly beautiful and revolutionary in terms of film-making, I think you'll find something else to take away from it. Interestingly, when Joe Lieberman said he voted against the Public Option because liberals were too excited about it, I thought in a similar fashion with this movie review. Only after sufficient conservative whining did I realize the potential fuss this movie could generate. 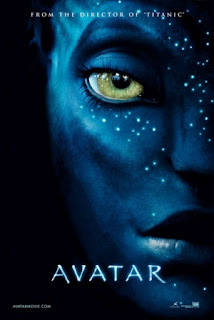 So I went and saw it, and to be honest, 99% of my satisfaction came directly from the imaginative and beautiful world of Pandora and the Na'vi- their story and lifestyle. Only a small sliver of me got excited because the message of the film was so clearly anti-imperialist and against American intrusion in the Middle East. So although most Americans will go and simply enjoy this film for what it is, a small minority will sh#t a brick and begin their political whining. In the same way, it would be awesome to keep the comments about this post strictly about the movie. I'm a little tired of hearing obnoxious "Hollywood is liberal" arguments, even if they are probably true. So what? STFU, sit down and watch the movie, and get over yourselves. Thank you, and Merry Christmas Lefties!